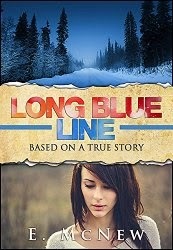 E. McNew is the author of Long Blue Line, a memoir about planned teen pregnancy. This is a memoir of my life from ages 14-22. It descriptively and honestly narrates the consequences that I faced after my planned teenage pregnancy became a reality. My childhood was suddenly gone, and I unknowingly stepped into a life of loss, grief, guilt, substance abuse, domestic violence and so much more. Who do you think would most benefit from reading your memoir? Any person who has struggled with guilt, substance abuse, losing children to the system, and other hardships will find inspiration from this story, and my hope is that it can offer other strength in knowing that they are never alone. Additionally, my memoir can benefit any person who wants an insider’s look into teen pregnancy and other issues, including parents, grandparents, teenagers, or any person just wanting to read a good book. Many readers have had a powerful, emotional experience reading your book and say it is a story that needs to be told. Why do you think people have responded so strongly to your book? I think that because my story is so dynamic there are many level of trials in life that many - if not most all people can relate to in one way or another. The book sparks an emotion that really takes you back to yourself as a kid, and the well-intentioned yet unrealistic ideas that came to mind as we tried to find ourselves. Although most of the responses to your book have been positive, a few have criticized you for the bad decisions (drug abuse, etc) you describe in your book. What was the purpose of sharing these incidents with readers? When I decided that I was going to tell my story by writing a book, I instantly knew that the story could not be told if I were to sugar-coat it. As difficult as it was, I forced myself to take myself back to those days of many, many mistakes and the consequences that followed. I put myself in the same frame of mind that I was in, writing down my every thought that I had as the events were unfolding. I did this to give myself a better understanding of my choices that were made, as well as offer others the same understanding that addiction can and will change a person overnight. The book is not meant to “redeem” myself for my choices. That simply can’t happen and I will not force it. The book is meant to spread awareness through education. And hopefully, prevent others from making the same mistakes. In your book, you chronicle a dark period of your life, involving addiction, jail, and other challenges. How is your life today compared to what you describe in the book? Although my current life is not in the book, I will be writing a sequel in the upcoming months. My life today is lived with purpose. I live with compassion, and I rarely judge others regardless of their own hardships. I live every day being grateful for what I do have, and I try to never take advantage of that. I’ve been blessed with a new family and a safe home, and beautiful two year old daughter who I treasure every minute of every day. You’ve made a dramatic transition, from struggling with addiction and being in jail to being a successful author and entrepreneur. What inspired you to put your old life behind you? I’ve realized that if I ever do get a chance to see my girls again, it will probably be my only opportunity to allow them to form their own opinions and feelings of me. I have no choice but to work hard each day to become the best person that I can be and live as an example for others. If I do not do this, it would only be a selfish and disrespectful way of life and wouldn’t show my girls how much I love them and want to be in their lives. Actions are really what speak, much more beyond words. One of the themes in the book is that being a parent is a huge responsibility and rushing into it can have disastrous consequences. Why do you think teen pregnancy continues to be such a large problem in America? I believe that society in general has formed guidelines, or a specific way to live by. Society tells us from a very young age what we are “supposed” to do. We are “supposed” to go to college, we are “supposed” to get married and have kids, we are “supposed” to work 40 hours a week. This is giving kids the impression that their personal happiness is only going to come from what we are “supposed” to be doing. I think that this is the core of where the teen pregnancy issue exists. If our parents, teachers and other examples were able to put an emphasis on allowing kids to explore and find their identities in less of a “by-the-number” way, our future generations could become full of amazing, talented and happy young adults. There needs to be more art, music, and creative programs available for every child to participate in. By helping children find their passion early in life, they are going to be enabled to chase their dreams and live their purpose right away. The void of boredom, curiosity and even depression would be replaced with who they are and what they love about life. I hope that my book will ultimately soften them. I hope it will educate them, help them to become less judgmental and motivate them to help themselves or others in a productive, yet compassionate way. Anger, judging and criticizing people, and stereotyping people into “statistics” will never change the sad realities that many people live in. It’s not going to improve the future for our children and grandchildren, unless we allow ourselves to become open-minded, compassionate and productive members of society. At the end of the book, you share a bit about your current life and your children, but many readers still have a lot of questions. Do you plan to write a sequel to your book? I do! The sequel is going to mainly cover the positive elements that have led me to my life today, which is certainly a life worth living! I’d like readers to go into this with an open mind and the primary goal of educating themselves. They should know that there are parts that will probably spark emotion, and maybe even anger. But, if the book is able to do this, it means that it must be one worth reading as it connects with you on a level beyond just reading a story.